Dana’s flexibility creates sealing solutions for every off-highway application. 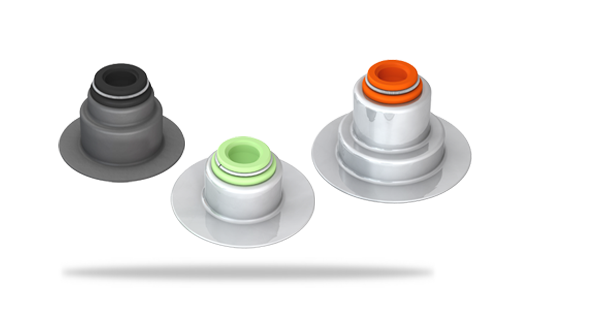 Our Victor Reinz® integral valve stem seals protect from the fouling of exhaust after-treatment devices caused by an increase in hydrocarbon and particulate emissions over time. Each of our valve stem seal designs is evaluated on an oil-metering rate bench test to ensure an optimum oil-metering rate for the best valve train durability, oil consumption, and emissions balance. Our proprietary fluoroelastomer compounds are mixed in-house and fully tested, allowing ultimate control over quality and performance. Each valve stem seal is taken through a state-of-the-art molding and assembly process. Every application uses custom designs and processes that best meet cost, performance, and timing goals.